(TORONTO, ON. February 17, 2017) – Lexus International today announced the ‘LEXUS YET’ exhibition as part of Milan Design Week 2017, the world’s largest design exhibition, also known as Salone Del Mobile. The Lexus exhibition will be held April 4th through April 9th, at the La Triennale di Milano, the Design and Art Museum in Parco Sempione – considered the center of Milan Design Week. Lexus and Oxman’s team share a deep commitment to making the world a better place through design and material innovation. 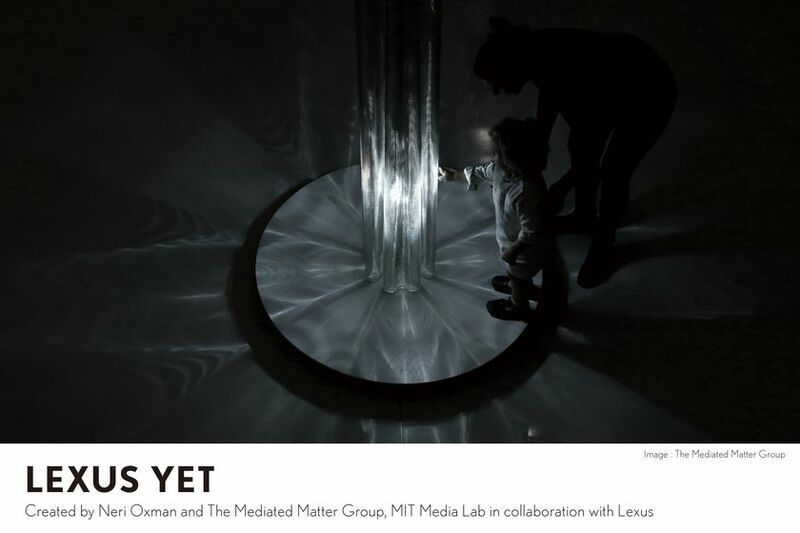 For the Lexus event, Oxman and her Mediated Matter Group will express the ‘YET’ philosophy in an immersive multi-dimensional installation of light and shadow brought together through a novel technology developed by the team. To complement what will be an immersive and amazing experience, Lexus will also showcase the 12 Lexus Design Award finalists’ works as prototypes and panel displays showing how they would apply the YET philosophy in original and innovative ways. Lexus further brings home its passionate commitment to design with a visually engaging and inventive retrospective of Lexus’ ten appearances at Milan Design Week. * The YET Philosophy drives Lexus to push the boundaries of creativity by fusing seemingly incompatible elements. It says “Don’t compromise; harmonize.” The resulting synergy sparks breakthroughs, while revealing possibilities beyond imagination. An Architect, Designer, Inventor and Associate Professor based at the MIT Media Lab, Oxman pioneered the field of Material Ecology, which considers computation, fabrication, the environment and the material itself inseparable dimensions of design. 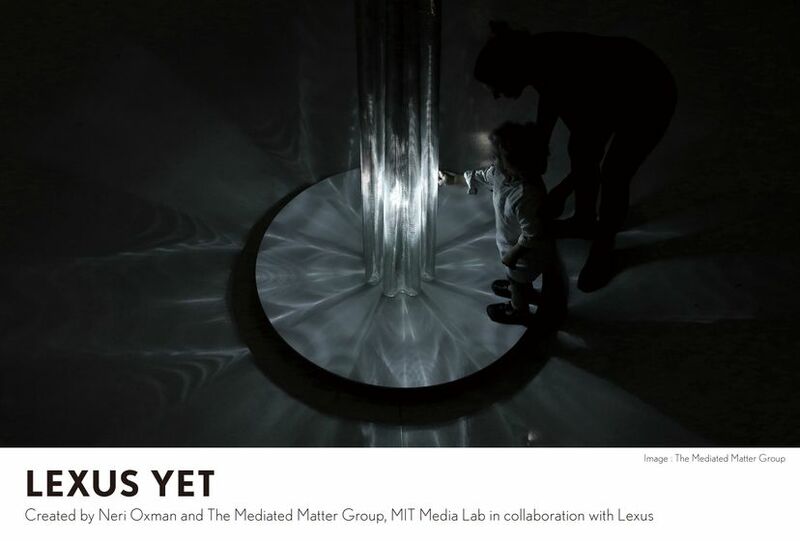 Oxman’s research and design team—The Mediated Matter Group—operate at the intersection of computational design, digital fabrication, materials science and synthetic biology; and applies that knowledge to design across disciplines and scales, from micro to building scale. Mediated Matter’s work is included in the permanent collections of Cooper Hewitt, MoMA, SFMOMA, Centre Georges Pompidou, MFA Boston, and FRAC Orléans, amongst other museums. Oxman is the recipient of numerous honors and awards, including a Graham Foundation Award (2008), the Earth Award (2009), the Vilcek Prize (2014), and the BSA Women in Design Award (2014). She is a Carnegie Pride of America Honoree (2014), and was named to ROADS' 100 Most Daring Cross-Disciplinary Thinkers in the World (2015). Oxman’s work and innovations have received recognition at the World Economic Forum and the White House. The MIT Media Lab transcends known boundaries and disciplines by actively promoting a unique, antidisciplinary culture that emboldens unconventional mixing and matching of seemingly disparate research areas. Designers, nanotechnologists, data visualization experts, mechanical engineers, material scientists, industry researchers, and pioneers of computer interfaces work side by side to invent -- and reinvent -- how humans experience, and can be aided by, technology. More information at www.media.mit.edu.